I've never really been one for pasta salad. Maybe it's because pasta salad is always up to interpretation. The salad may include...unfriendly vegetables. Over time my interpretation of unfriendly veggies has changed. Fifteen years ago a lot of things were on my do not serve list. But times change. Raw onions? Not on my burger, but in my pico de gallo or ceviche? Si. Mushrooms have a very limited time and place. But the nice thing about cooking for yourself? You make all the decisions. You don't have to include that ____________ (disgusting food with the weird texture) ever again. I found the original recipe on CookingLight.com. Knowing how I feel about onions, in some cases, I opted not to include the thinly sliced green onions. But don't let that stop you. I also didn't have fresh dill, so I used the dried dill. I didn't use the 1/4 of a cup that you would use for fresh, but probably a tablespoon or so of the dried. Cook orzo according to package directions, omitting salt and fat. Drain, rinse with cold water, drain again. 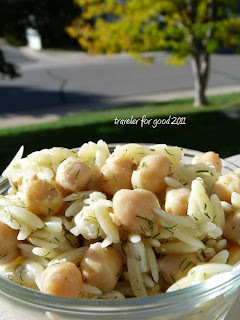 Combine pasta, onions, cheese, dill and chickpeas in a large bowl. Toss gently to combine. Combine juice, oil, water, salt and garlic in a small bowl, stirring with a whisk. Drizzle over pasta and toss gently to coat. I chilled this salad for a few minutes before serving. Enjoy! I made this salad after returning from dropping off over 100 pairs of shoes off at the Denver Soles 4 Souls warehouse for Flippin Good Deeds Challenge. We met the volunteer who handles all the shoe donations for the area. Shoes are tied / rubber banded together and bagged 20 pairs at a time. In general shoes are picked up once there are 25,000 pairs. This seems like a huge number of recycled shoes, except that last year Americans threw away more the 300 million pairs (per the S4S website). These donated shoes then take a trip to either Iowa or Alabama where they will be sorted by usability, function and size. Shoes are used in charitable programs here in the US (such as providing shoes for work and interviews) as well as going abroad. 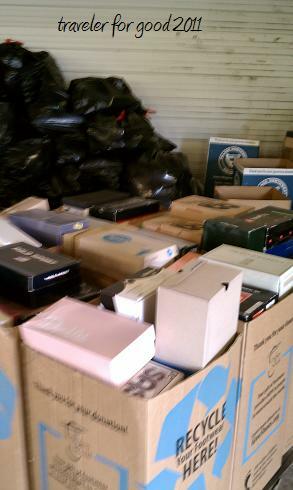 You can donate shoes (10 pairs or less) at local drop off locations. Here in Denver many of the Whole Foods stores accept shoes. Click here for local donation sites in your area. If you're donating shoes in the next month, you can help me with the Challenge by sending in THIS FORM which will credit my blog. Where is the West Coast?